This Floral Urn tapestry shows a work of artist Vail Oxley. In this scene we see a brightly sunlit garden stairway with urns and a charming cottage, with lovely trees and blossoms decorating the entire scene. The light of the day is enchanting as it provides the effect of beautiful illumination to uplift the scene. The works of Vail Oxley shows the beauty of nature and the most charming of villages. 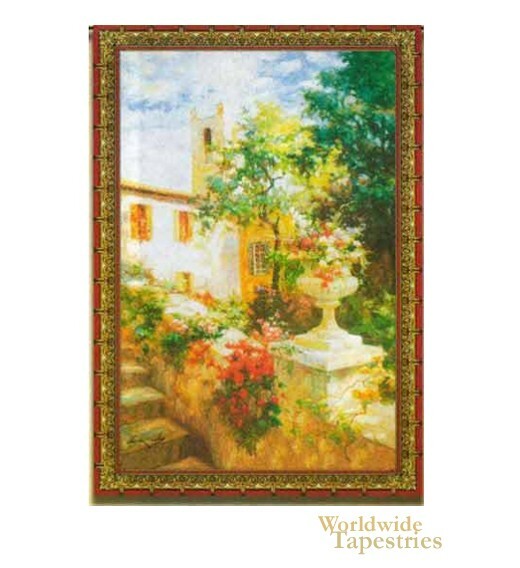 This Floral Urn tapestry is backed with lining and tunnel for easy hanging.